I got a call from the Princeton Acura daalership earlier this week. The airbag in wife’s 2013 RDX was recalled; part of the Takata airbag re-call from a few years ago. I cheated with the service representative and agreed that we would bring the car in on Saturday morning around 8AM. My wife is not an early rise so I volunteered to do it. It will still dark outside when I woke up. I went down stairs ton make coffee and iput in a new CGMS sensor. Inserting the sensor took longer than I expected. I stared the kettle and then thought of an even better idea. I could quickly get a cappuccino and blueberry muffin at Rojo’s before heading to the dealership. But it was not to be. I got to Rojo’s and was disappointed to find out they would not open. It was my fault. I should have checked the business hours for the weekend before leaving home. It was cold Saturday morning. I wanted coffee. I wanted breakfast. I pulled out my camera and stared through the window of Rojo’s thinking about where to go. I noticed that the street was reflected in the glass. I noticed the lights on inside even though the store was close. 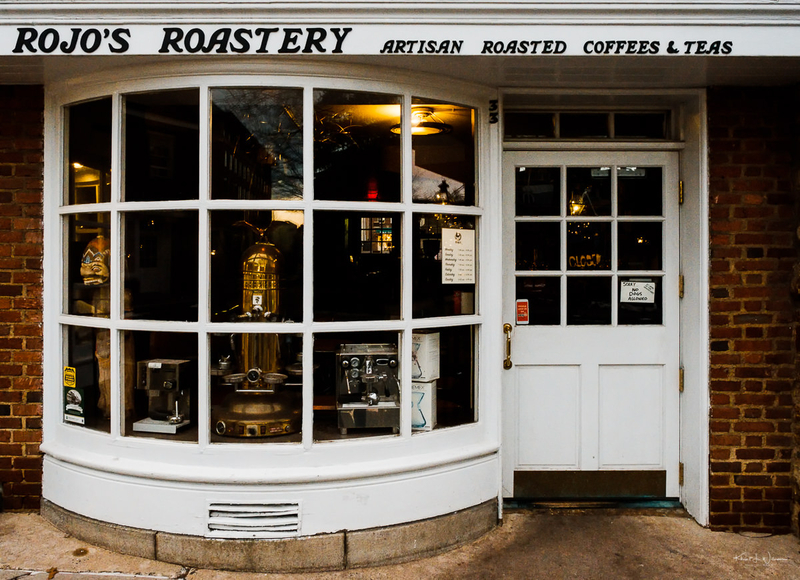 I noticed that the gold color of the light was reflected in the gold coffe maker in the front window. I noticed. Then took my photo and went off to the Panera in West Windsor for breakfast.